The ugliness was quickly apparent. Gordon Hayward had just come down awkwardly after being fouled going for a lob pass, and his left ankle cocked to the side was gruesome. That's in the past, but the ugliness is not. Gordon was honest about the difficulty of his recovery and the fact he would not be the same player right away. Some fans have quickly, and conveniently, forgotten that. His shooting and defense have been sub-standard, but his rebounding, passing and court-awareness have not. His timing and quickness are off, but he knows the right play to make at the right time. His body just is not cooperating - not yet. Do fans remember this is an 82-game season - hopefully followed by a long and successful playoff run? When your body fails you, you start to doubt yourself. Hayward may be somewhat of a liability now, so that later in the season he will be the Gordon that we brought here with Championship aspirations. He needs the floor time. The never-ending boos from Utah fans, and the negative reaction from Boston fans is very simply just bad! Here comes the good. I watched the Utah Jazz play the Boston Celtics Friday night, an exciting basketball game. I always adored Gordon Hayward when he was on the Jazz and was devastated when he left. I felt very sorry for Gordon when he got nothing but boos! However, revenge is sweet. I admire all of the Jazz players and appreciate Donovan Mitchell. My best wishes go to Gordon Hayward, and may his endeavors be successful! The sign holders had Gordon's last name misspelled, but the nice thought was there. The boos were a bad thing, but many of those jeering Utah fans were not expressing their true feelings. They loved Gordon, and so do we. He needs to know Boston is behind him all the way. I see a fine, talented man doing his best to come back 100% from a devastating injury - and succeeding. What do you see? 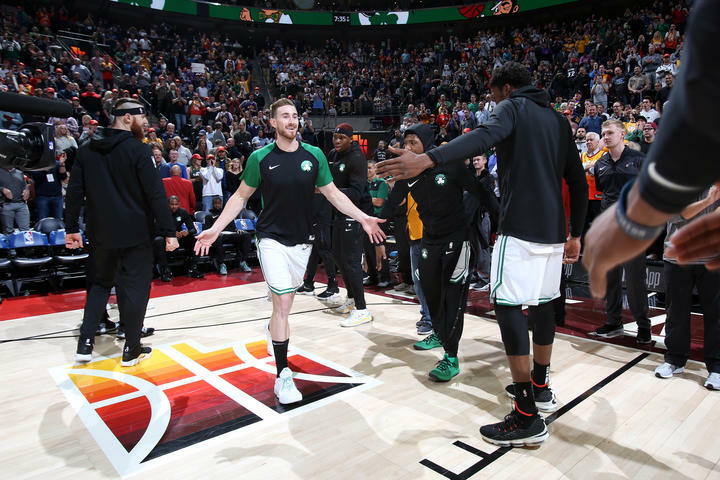 When the Jazz come to town on Friday, the Boston cheers for Hayward need to drown out his memory of the boos from the Utah spectators. He is our guy and we will be glad for that.